The Youngstown State University football team placed three players on the Missouri Valley Football Conference 2018 All-Newcomer Team, nine players on All-MVFC teams and two on all-MVFC academic team. 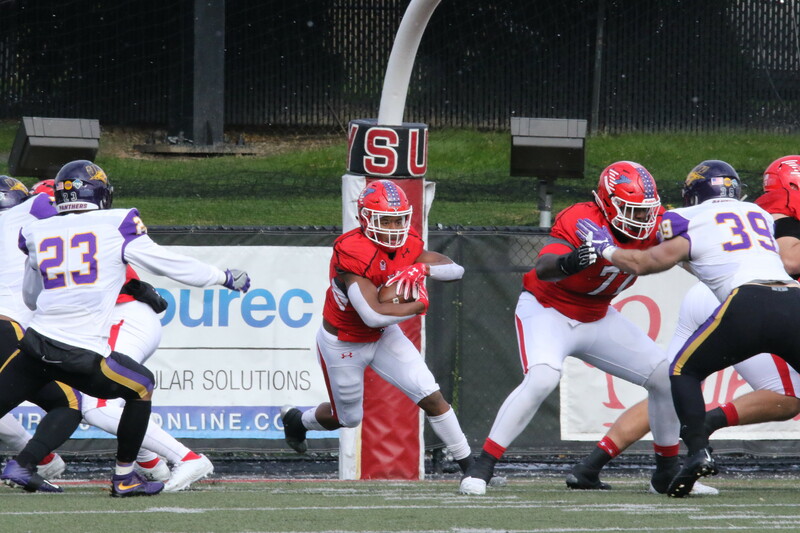 YSU senior quarterback Montgomery VanGorder, redshirt freshman tight end Miles Joiner and redshirt freshman linebacker Ray Anderson were named the conference’s all-newcomer squad. VanGorder is the first YSU quarterback since Kurt Hess in 2010 to make the All-Newcomer Team and is the fifth Penguin signal caller to be named to the squad. Anderson is the first linebacker since Lee Wright and Armand Dellovade in 2015 to be recognized. Joiner is just the second YSU tight end and first since Louis Irizarry in 2006 to make the All-Newcomer Team. It marks the second straight year the Penguins have had three players make the MVFC All-Newcomer Team. Dellovade and senior center Vitas Hrynkiewicz were named to the All-Academic Team. Dellovade was named to the second team while Hrynkiewicz was tabbed honorable mention. It is the second year both student-athletes were named academic All-MVFC. In 2017 as juniors, Dellovade was a second-team honoree while Hrynkiewicz was a second-team pick. Dellovade was also a second-team recipient in 2016 as a sophomore. On the field, Dellovade and Hrynkiewicz were both recognized as second team All-MVFC picks. YSU seniors Tevin McCaster, Gavin Wiggins and Steven Wethli were named first team All-Missouri Valley Football Conference. A total of nine Penguins received honors, with three more on the second team and three were named honorable mention. Dellovade, Hrynkiewicz and Savon Smith were second team selections. Penguins recognized as honorable mention were safety Chrispin Lee, defensive tackle Shereif Bynum and Joiner. McCaster was recognized as a first-team honoree for the second straight season. Wiggins was a second-team honoree in 2017 while Wethli becomes the first long snapper in school history to earn first-team all-league accolades. Dellovade earned second-team honors for the third consecutive year. He was a four-time all-conference selection in his career after being recognized as an honorable-mention pick in 2015. He is the first player in school history to earn all-conference accolades in four straight seasons. Hrynkiewicz was named second team all league for the second straight year while Smith received honors for the first time in his career. The seniors on the team were part of some historic teams over their time. Senior linebacker Armand Dellovade was a four-time All-MVFC selection, earning second-team honors on three occasions. Dellovade had 102 tackles in just 11 games in 2018. He started 47 of 49 games at YSU. He had 337 total tackles in his career, including 198 solo stops. He finished 12th in school history in career stops and had the most tackles by any YSU player since 2000. Senior tailback Tevin McCaster was a two-time first-team All-MVFC pick. He is the first YSU tailback since P.J. Mays in 2001-02 to earn first-team All-MVFC honors in consecutive seasons. McCaster rushed for a career-high 1,235 yards on 269 carries in 2018. He had seven 100-yard rushing games. For his career, he rushed for 2,970 yards on 626 attempts and scored 36 touchdowns in 42 games played. He ranked seventh in career rushing attempts, seventh in rushing touchdowns and ninth in rushing yards in school history. Senior Gavin Wiggins started all 42 games of his YSU career on the offensive line. Wiggins’ first start came at Western Illinois University in 2015. Senior center Vitas Hrynkiewicz started all 38 games in his Penguin career. He was in the starting lineup every game the past three seasons. YSU’s specialist grouping of kicker Zak Kennedy, punter Mark Schuler and long-snapper Steven Wethli all wrapped up their impressive careers. Wethli was a four-year starter and snapped on 472 kicking attempts in his career. Kennedy ended his YSU career with 302 points, making 54-of-80 field-goal attempts and 140-of-143 extra-point tries. Kennedy, who appeared in 47 games, made his final 75 PAT kicks of his career, a school record. Schuler, who played in 36 games, wrapped up an impressive three-year career by averaging 40.9 yards per punt on 160 attempts. Schuler’s career average ranks third in school history. In his lone campaign with the program, VanGorder started 10 games for the Penguins. VanGorder completed 149-of-277 points for 1,934 yards and 14 touchdowns. The 14 touchdown passes were the most by a YSU quarterback since 2014. He had five 200-yard passing efforts. Senior defensive tackle Savon Smith finished his career with 109 total tackles, including 70 stops. Smith played in 43 games in his YSU career. Avery Larkin, Johnson Louigene, Curtis Parks, Donovan McWilson, LaMont Ragland and Chrispin Lee all played in over 30 games as a Penguin.